As part of our #CoffeeReimagined campaign – we partnered with foodie and MasterChef Australia 2017 finalist, Arum Nixon. Using our Costa Rica Single Origin beans sourced from the Coope Tarrazu region, one of the most famous coffee-growing regions in Costa Rica. 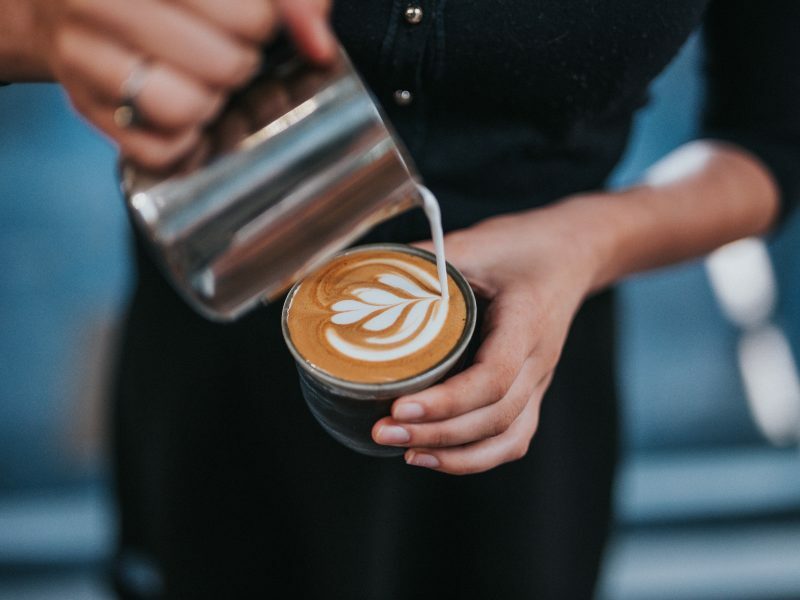 The tropical and volcanic environment creates a smooth silky coffee with rich milk chocolate flavours and a nutty pecan finish with a crispy citrus intensity. 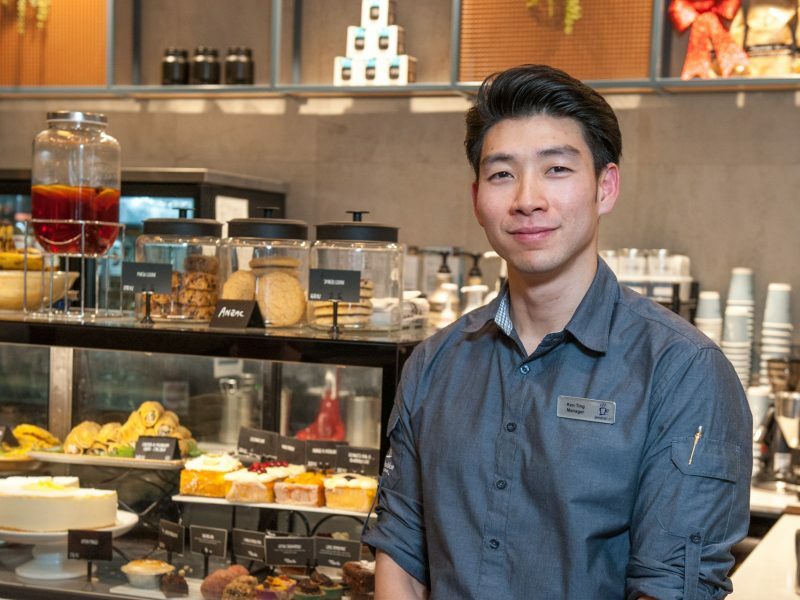 Arum has a passion for cooking and loves to focus on cooking the amazing Australian produce found on his doorstep. 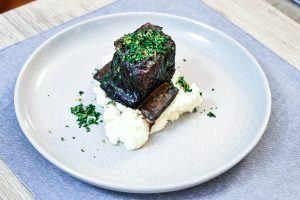 He aims to make each diner feel connected with where their food comes from and emphasis the little touches that make a meal feel truly special. 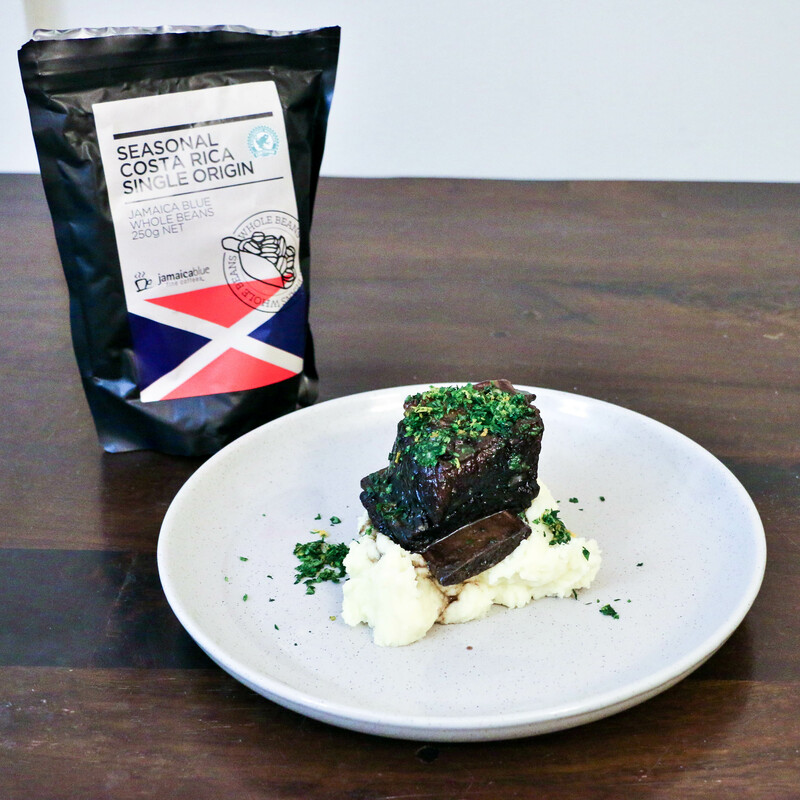 He has created a Coffee-braised beef with gremolata served with a horseradish mash recipe to celebrate the Jamaica Blue limited edition Costa Rica Single Origin Coffee. 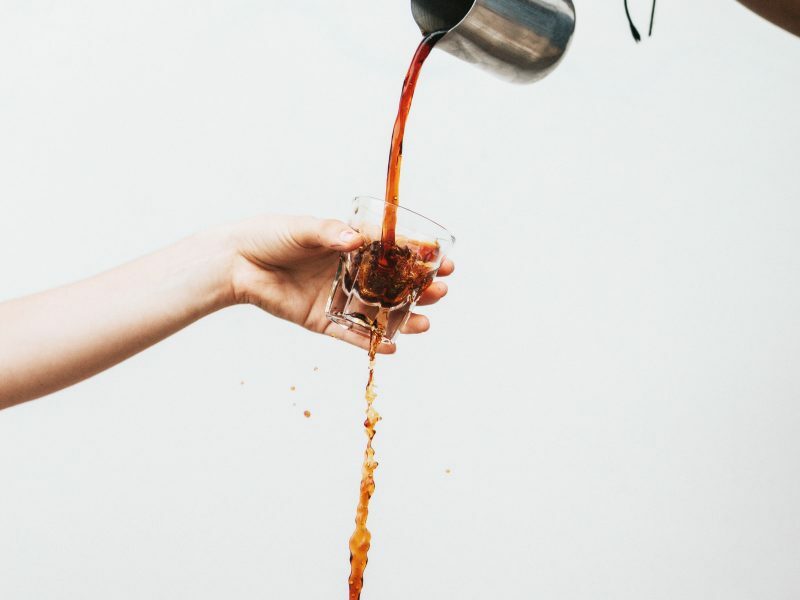 What a creative way to incorporate coffee into a savoury cuisine. 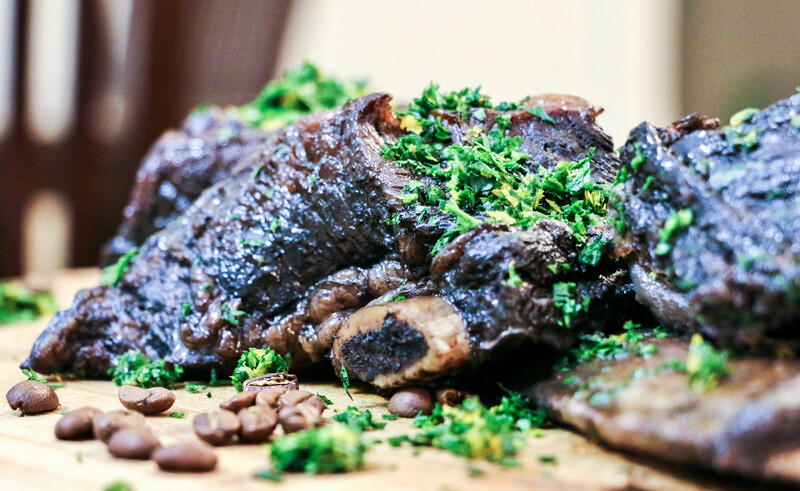 To create this dish at home, you can buy these beans at your local Jamaica Blue, or order online. 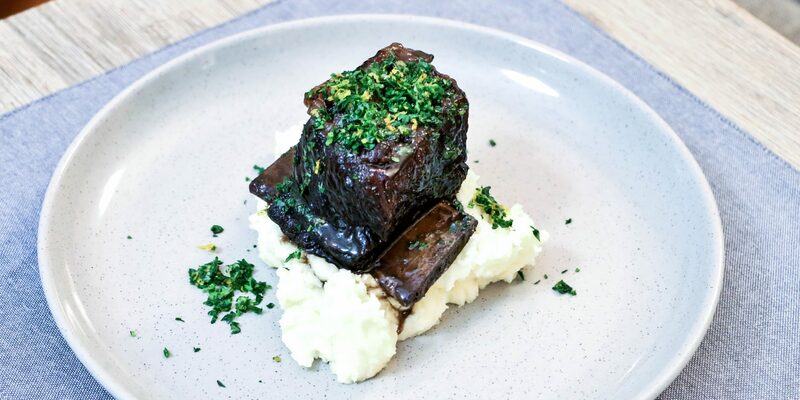 Embrace Autumn with this recipe that is guaranteed to warm your soul – perfect for your next dinner party or even for a hearty meal prep. *If they weigh much more, you can get your butcher to cut them in half for you. 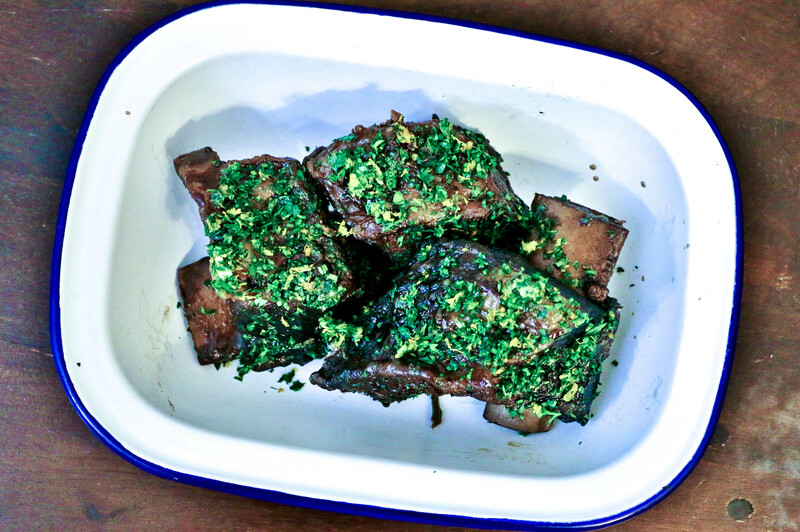 To make the braised ribs, heat the oil in a large frying pan over a medium-high heat. When hot, add the ribs, one at a time, and fry on all sides until well caramelised. Transfer to a roasting tray large enough to fit all the ribs snugly but not tightly packed. Tip out any excess oil and beef fat, reduce the heat to medium, and add the onion. Fry, stirring frequently, for 5 minutes until softened, watching to make sure they don’t burn. Add the coriander seeds, peppercorns and cinnamon stick, and fry for a further minute. Add the coffee and wine to the pan, and stir to pick up all the bits stuck to the bottom of the pan. Pour the contents of the pan into the roasting tray over and around the ribs. Finally add the stock – you may not need it all, depending on the size of your roasting tray. The liquid should come most of the way up the ribs. Cover the roasting tray with a double layer of foil and seal tightly. Place in the centre of the pre-heated oven for 3-4 hours, basting the ribs occasionally with the cooking liquid, until the meat is very tender. Remove from the oven and allow to cook for ½ hour in the juices before removing and setting aside under foil to keep warm until ready to serve. Tip the cooking juices through a fine sieve into a medium pan, and heat over a medium-high heat for 10-15 minutes until reduced to a sauce consistency. Set aside until ready to serve. 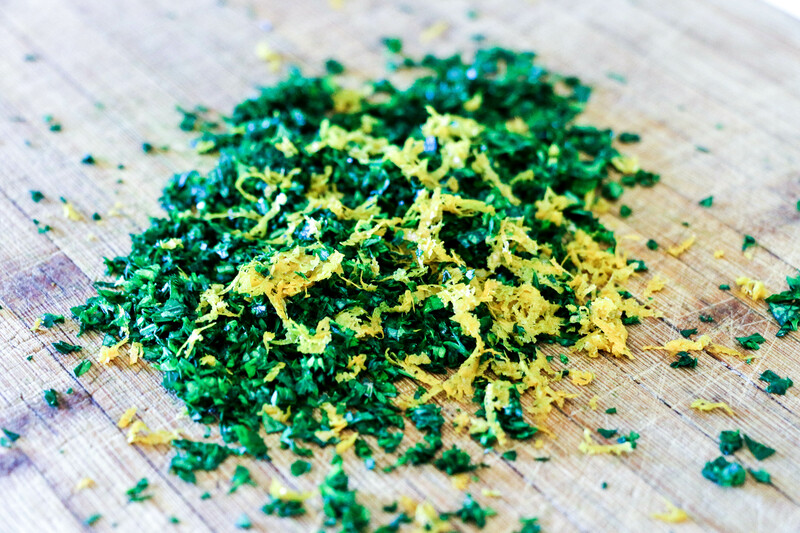 To make the gremolata, finely chop the parsley using a very sharp knife. Grate over the garlic and orange zest, then continue to chop to combine all the ingredients. Set aside until ready to serve. To make the horseradish mash, bring a large pan of salted water to the boil and add the potatoes. Cook for 15 minutes or until just tender. Drain well, add the butter and horseradish, and mash well. Add the milk and continue mashing until a smooth consistency. Adjust seasoning and set aside until ready to serve. To serve, put a large spoonful of the mash on each plate. Coat each rib thoroughly in the reduced sauce and place on the mash. Top liberally with the gremolata, and serve the remaining sauce on the side.